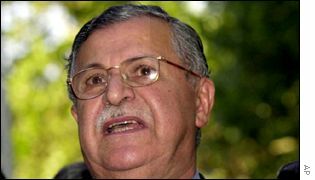 Jalal Talabani, widely referred to by Kurds as Mam (uncle) Jalal, is one of the longest serving figures in contemporary Iraqi Kurdish politics. A Baghdad University law graduate, he is considered to be a shrewd politician with an ability to switch alliances and influence friends and foes alike. Mr Talabani is the leader of the Patriotic Union of Kurdistan (PUK), one of the two main parties controlling the Iraqi Kurdistan region. The party has traditionally drawn its support from among the urban population and radical elements in Kurdish society. Based in Sulaymaniyah, it controls the south-eastern part of Iraqi Kurdistan - with the rival Kurdistan Democratic Party, KDP, to the west and the central government to the south. The PUK commands a militia force of more than 20,000 men, which could play a role in realising the United States' aim of "regime change" in Iraq. Mr Talabani has been seeking US support for federal status for Kurds in any settlement of a post-Saddam Iraq. Born in 1933, Jalal Talabani began his political career in the early 1950s as a founder member and leader of the KDP's Kurdistan Students Union. He rapidly moved up within the party ranks to become a senior member of the KDP. In 1961, he joined the Kurdish revolt against the government of Abd-al-Karim Qasim. After the coup that ousted Qasim he led the Kurdish delegation to talks with President Abd-al-Salam Arif's government in 1963. Subsequent differences with KDP leader Mustafa Barzani began to emerge and in 1975 he joined a KDP splinter group, the KDP-Political Bureau, led by his future father-in-law and the party ideologue Ibrahim Ahmad. In 1966, the group formed an alliance with the central government and took part in a military campaign against the KDP. The group was dissolved when the KDP and the government signed a peace agreement in March 1970. Jalal Talabani and a number of others founded the PUK in 1975. A year later he began an armed campaign against the central government. The PUK suffered a severe setback when the Iraqi Government used chemical weapons against the Kurds in 1988, and Mr Talabani was forced to leave northern Iraq and seek refuge in Iran. The Talabani-Barzani or PUK-KDP rivalry has been a dominant factor in Iraqi Kurdish politics for the last three decades. A new era in Mr Talabani's political life began in the aftermath of the 1991 Gulf War and the Kurdish uprising in the north against the Iraqi Government. The declaration by the Western alliance of a no-fly zone and a safe haven for Kurds marked the beginning of a short-lived honeymoon with the KDP. Elections were held in Iraqi Kurdistan and a PUK-KDP joint administration was established in 1992. The underlying tension between the two parties led to armed confrontation, dubbed the fratricide war, in 1994. After concerted efforts by the US and, to a lesser extent Britain, and numerous meetings between the two parties' delegations, Mr Talabani and KDP leader Massoud Barzani signed a peace agreement in Washington in 1998. The accord was further cemented on 4 October 2002 when the regional parliament reconvened in a session attended by both parties' MPs. In that session, Mr Talabani proposed that the parliament should pass a law prohibiting and criminalising inter-Kurdish fighting.